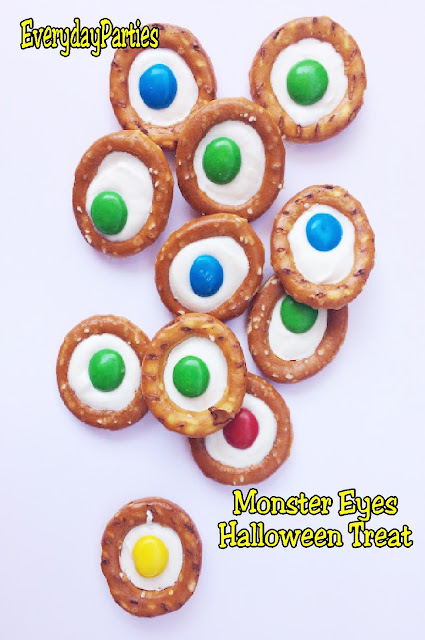 Make a sweet, simple, and delicious treat for your Halloween party with these Monster Eyes pretzel treats. They are just "scary" enough to fit in at the Halloween dessert table but yummy enough that little Halloween guests will love them. 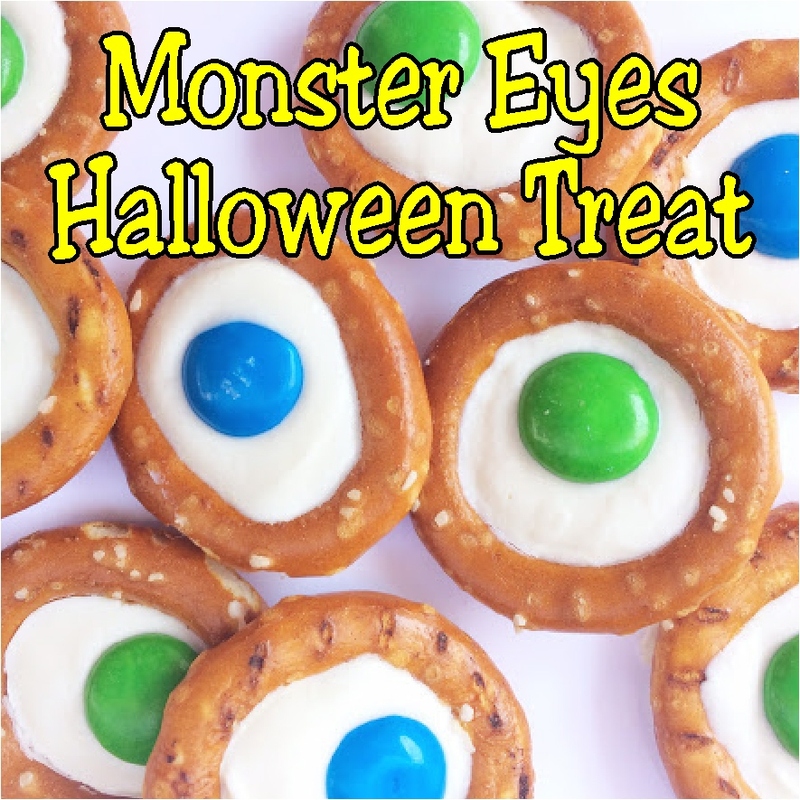 Although there aren't really any monsters in my Halloween party plans, these Monster Eyes are so yummy and easy that they are going to find a way into my party dessert table one way or another. The hardest part of the whole creation was waiting for the circle pretzels to arrive from amazon. And even with two day prime shipping, that was two days too long. Fortunately they came in a big container, so I can make plenty of these as pre-party treats and then enough for our Halloween party. I looked high and low in all my local grocery stores and couldn't find any of the circle pretzels I wanted for this project. So I ordered some from Amazon, grabbed a bag of M&M candies and a bag of white Chocolate melting wafers and got to work. Melt some of the white chocolate wafers in a microwave proof container. I love to use these jars to melt in, that way I can just seal the extra up and use it for my next project. There's no waste and not much clean up. To melt white chocolate, you need to be super careful since it burns super easy. Place it in a glass container and melt at 50% power for one minute at a time. Stir the chocolate in between minutes to make sure you don't burn it. Once the chocolate is a smooth and easy consistency, lay the pretzel treats on to wax paper and spoon a little bit of the chocolate in the center of each of the pretzels. You will want to make sure you get the edges of the pretzel good so the chocolate will secure to the pretzel and stick them together as it dries. If you need to smooth out your chocolate a little bit after pouring it into the pretzel center, you can very careful tap the outside of the pretzel to help the chocolate lay flat. Before the chocolate hardens, add a M&M to the center of each of the pretzel eyes. Place the pretzel treats in the refrigerator and let harden about 20 minutes. See, I told you they were super easy. I am going to have to create some place setting and table cards now to find a way to add these to my Halloween dessert table. What kind of treats are you going to have at your Halloween party? Are you going sweet? Savory? Or just scary?